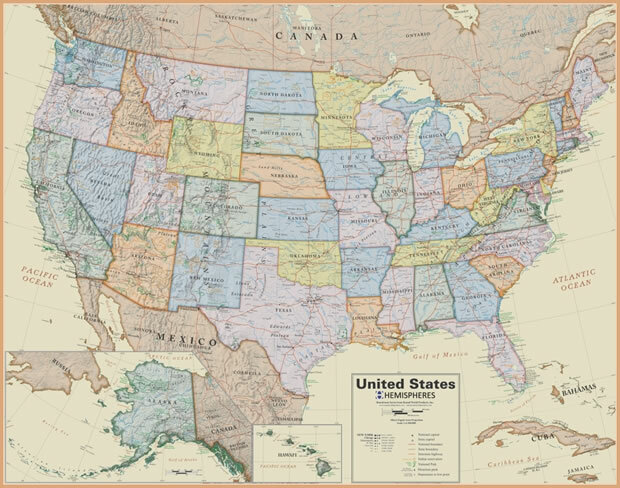 United States Wall Map - Laminated, Boardroom Style, $19.99! Map Dimensions: 38 inches tall x 48 inches wide. Click here for more detail. The Boardroom Laminated Wall Map of the United States is the perfect map for offices and conference rooms. It is laminated and has a subtle color scheme. This allows you to use brightly-colored push-pins, sticky notes, flagging, and dry erase markers to annotate the map with the geography of your company, trip planning, or travel routes. When finished just remove the markers and use a dry eraser to clean the map. It is attractive, highly informative, laminated for durability, large format, and reasonably priced. We want to be sure that you receive this map promptly and in perfect condition. It is first rolled and packaged in an attractive display box. Then we will place it in a sturdy map tube for mailing. It will then be shipped by Priority Mail through the United States Postal Service. You should receive it in just a few days - even if you are in Hawaii, Alaska or one of the United States Territories. We regret that we are unable to ship any purchases outside of the United States and its official territories. The exception is for APO and FPO addresses that can be delivered via U.S. Mail. If you order other items at the same time, they will be shipped in a separate package. Each of the fifty United States is shown in a beautiful color. Capital cities are marked and major cities are shown with a symbol that reflects their population. Interstates and major highways are shown as red lines. Major physiographic features such as mountain ranges and valleys are shown in shaded relief. Major National Parks and Indian Reservations are outlined. The map has a smooth laminated surface that you can mark on with dry-erase markers. These marks wipe right off with a soft cloth or dry-erase eraser. This is a good map to use for planning trips, selecting locations for sales meetings and other company business. You can display the places you have visited with push-pins, attached photos or sticky notes. The lamination makes this map easy to hang without a frame and easy to clean if needed. It also protects the map while it is in use or being handled. The map presents the United States using an Albers Equal-Area projection at a scale of 1:4,100,000. Inset maps for Alaska and Hawaii are included at a different scale.